The 2018 Annual Members’ Meeting and Fall Foliage Tour will take place on Saturday on October 6, 2018. 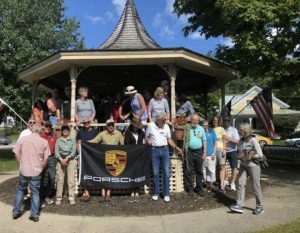 The Tour will begin at the famous P&H Truck Stop in Wells River, VT and end at the Von Trapp Bierhall in Stowe, VT where we will have lunch and the Annual Meeting. The Tour which is expected to last between 2.5 to 3.0 hours will be led by Peter and Ellen Arnold who have “assured” us of peak foliage. The Tour details will be forthcoming, in the meantime Events Chair and VP Carl Wulfestieg offers the following outline. The cost per person is $45.00, please register via Motorsportreg.com by 1 October. We need to guarantee a minimum number of attendees to the restaurant so it is imperative that you sign up by the 1st of October. The 2018 Annual Members’ Meeting will follow lunch and is particularly important as we will be holding elections for President, Vice-President, Secretary and Treasurer to lead our organization from January 1, 2019 through December 31, 2020. Note, if you are not able to join the Tour we encourage you to attend the Members’ Meeting.